The property began its existence as the George H. Russell Horse Market / Star Stables in 1906. It was also the Lauritzen Tonic Co., John W. Brady Horse Market, Depot Saloon, Efaw Livery, Ingle Garage (which burned in 1923), Square Deal Transfer Co.
(Garford Truck Co.), a storage plant and in 1962 it was approved as a fallout shelter. I went into the building in the 1990s when it was being converted into mini storage and remember the owner saying that it has been used as a house of ill repute. Apparently it was a popular place with the sailors who had shore leave in Tacoma. 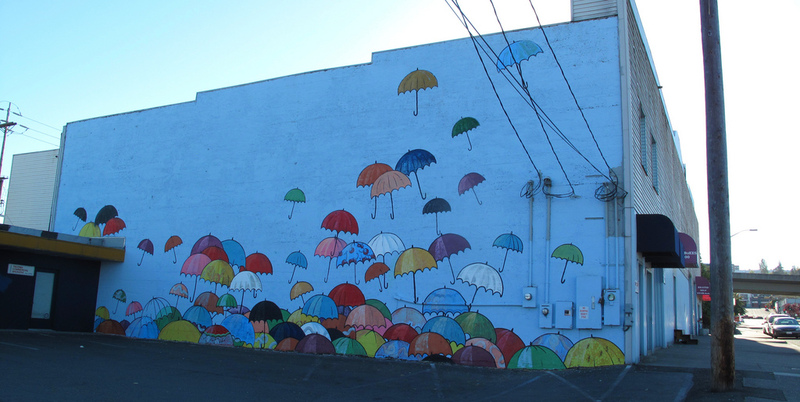 This entry was posted in Art -- there is art here!, Historic Sites, Service Places, Tacoma, WA State - Pierce County and tagged Fallout Shelter, horse, market, mural, rain, Stables, Storage, Storage Box, Tacoma, umbrellas on September 11, 2012 by admin. You bet! What a great mural!